Feathers and down from geese and ducks are used in the clothing and household linen industries, for example in coats and jackets, pillows and duvets. The most valuable product is the down, which is obtained from the breast area, followed by the fine feathers. Most commercial products contain a blend of both down and feathers; the higher the proportion of down, the higher the value of the product. Feathers and down can be removed after birds have been slaughtered. However, in some countries, feathers are also collected from live birds. Feathers and down collected by live plucking are considered to have a higher value than feathers and down collected after slaughter. Live plucking is more common in geese than in ducks. All breeds of geese can be plucked, but white plumage is more valuable. Geese that are raised for meat or foie gras production, as well as breeder flocks, may be live plucked. The practice of live plucking is common in Eastern Europe and Asia. Plucking may be performed several times during the bird’s life, with the first plucking usually carried out between 10 and 11 weeks of age when the feathers reach maturity and then approximately every 6 to 7 weeks thereafter, as this is the period necessary for the new feathers to mature. Geese fattened for slaughter are plucked alive either once (if slaughtered at 17 weeks of age), or twice (if slaughtered at 24 weeks of age). The actual number of pluckings for market geese generally depends on the market conditions for the meat or fatty liver and the current market value of the feathers and down. Geese normally live in small family units and mate for life, living up to 20 years and flying long distances. 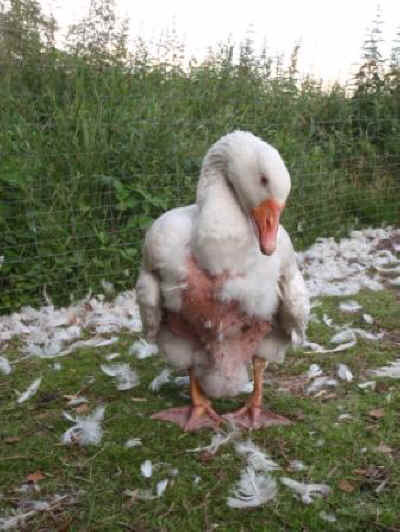 Under normal conditions, a goose develops its first full coat of feathers at about eight weeks old and will molt (gradually shedding old feathers and growing new ones like all birds) each year.